The Occupy Wall Street movement plans to marks its anniversary on Monday by “shutting down intersections and getting arrested,” Caleb Maupin from the International Action Center told RT. “The US is part of the world capitalist economy, and that world capitalist economy is in a state of collapse,” Maupin believes. RT: Activists have not applied for a legal permit to "Occupy Wall Street" on Monday – what response do you think they'll get from the authorities? 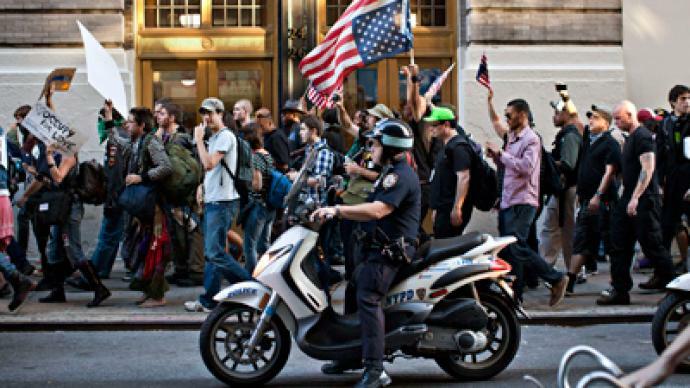 Caleb Maupin: Well, in New York City there are demonstrations all the time where that are peaceful, legal; there are strolls where people are marching down the street with signs. 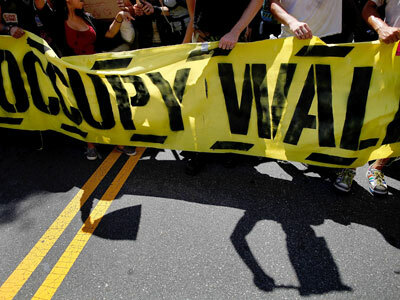 But Occupy Wall Street has changed history, because it is an unorthodox political movement. It’s a movement about not creating theater, not about walking with signs. It is a movement of confrontation – the confrontation between millions of mainly youth, working class youth in this country who have no chance of finding a job or decent employment and are going out on the streets and demanding justice. I know on Monday there are plans of civil disobedience – people are planning to shut down the intersections and get arrested. There are plans to do everything they can, to use their bodies as weapons against the one percent, which is driving to force the people of this country and the world into deeper and deeper poverty while they enrich themselves with profits, with wars and with death and destruction. RT: So during confrontation and intentionally breaking the law – doesn’t that undermine the whole movement when particularly so many supporters want to pursue the legal protest? CM: I think there is a whole history of civil disobedience in this country being used as the means being used of expressing oneself and we’re in a situation where people are being illegally foreclosed upon throughout the country. Police are illegally murdering the people on the streets, so if people that oppose what is going on are going to peacefully march like they’ve being doing for centuries, that is not going to solve the answer. People need to confront the status quo and to fight back, and that's what's going on. 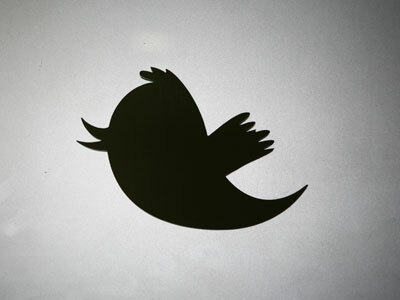 RT: Social network Twitter's been ordered by a New York judge to hand over the tweets of an Occupy activist – what sort of precedent does this case create? 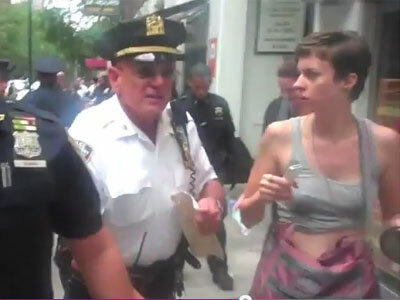 CM: It certainly shows how threatened they are by Occupy Wall Street. Occupy Wall Street has captured the imaginations of so many millions of working class people in this country and it caused such an uproar because so many people understand the concept of the 99 percent and the one percent, and that scares the one percent and their government very much, so they’re going to be cracking down on civil liberties all the time. 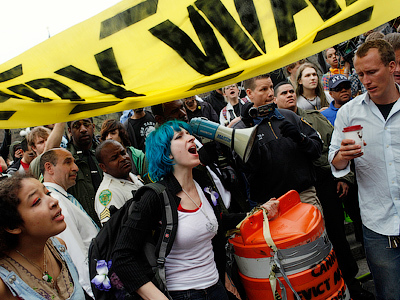 The NDAA, the National Defense Authorization Act, was probably a direct response to the Occupy Wall Street. There’s so much fear in the power, because for so long the people of the United States have very passively sat by and accepted all of the right-wing measures by the government, but all a sudden, out of the blue, the working class is in motion again, youth are in motion, and suddenly, they are starting to fear. RT: The Occupy movement's been criticized in the media for lacking a unified program and a clear leader – is that still the case? CM: If one looks at all of the revolutions in the past, they always began with very vague ideas. The Mau Mau revolt in Kenya, that began with a vague slogan of “Land and Freedom,” the Russian revolution began as a revolt against the Tsar and the Bolsheviks eventually transformed into a struggle for “Peace, Land and Bread.” Revolutions often begin with vague types of understandings and outpourings, and eventually the demand develops as the struggle matures and gets to the point of actually seizing power. RT: Is the movement looking for a particular leadership or party, that will actually listen to their concerns, after all many would say that the political system in the US is not meeting the demands of so many? CM: Absolutely. The Occupy movement is largely rejected by both the Democrats and the Republicans, the two wings of corporate rule in the United States and they’re very much exploring the alternatives to Democrats and the Republicans and alternatives to the capitalist system. Many are looking into socialism and communism, to the system where profits rule and we just get wars, we get home foreclosures and mass unemployment. Yet all this wealth exists but it is not utilized for human good. RT: The movement has seemingly lost momentum in recent months. Will it be able to recapture its former nationwide strength? CM: I would say without a doubt. If one looks at the world right now, if one looks at what's happening in the Middle East, in Spain, in Greece – everywhere there’s a confrontation going on against the one percent, so the idea is that somehow the US is exceptional and it is just a small passing phase … the US is part of the world capitalist economy and that world capitalist economy is in a state of collapse. So absolutely we’re going to see more revolts. It make take on a different character: organized labor in Chicago, the organized teacher’s strike may become more prominent than the early days of Occupy Wall Street. But there are going to be more confrontation as the system dies.